When he arrived in North London from Borussia Monchengladbach for a reported fee of £35m, it is is unlikely Granit Xhaka would have envisaged his first few months going as they have. So far, Arsenal have had three big matches – Liverpool (home), Paris Saint-Germain (away) and Chelsea (home). Xhaka has been on the bench for all of them. Ahead of him has been the pairing of Francis Coquelin and Santi Cazorla, Arsène Wenger’s first-choice midfield duo from last season. Xhaka may have arrived as Arsenal’s big summer signing but that has not wavered Wenger’s allegiance to Coquelin and Cazorla. In some ways, it makes sense. Prior to Cazorla’s injury last November, the Spaniard and Coquelin formed a formidable partnership. You only need to see how Arsenal’s form dipped in the following months to realise how big an impact the breaking up of that duo had. We also know all about Wenger’s loyalty – his faith in the midfield that served him so well last season should come as no surprise, for this is a man who will back his players to the hilt. While others may have binned off the likes of Aaron Ramsey and Laurent Koscielny during difficult days in the early stages of their Arsenal careers, Wenger stayed true. He kept the faith and he has been rewarded. The same is going on now with Alex Oxlade-Chamberlain, while the decision to give Theo Walcott yet another chance in the summer to prove his worth this season is another example of Wenger’s loyalty. In many ways, it is the Frenchman’s biggest strength and his biggest weakness. 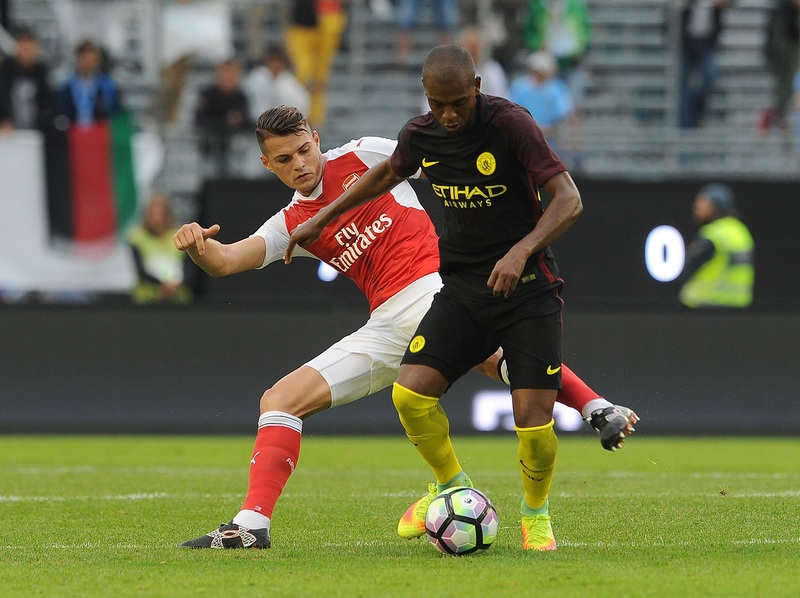 Xhaka has impressed this season when given the chance. But when it comes to Xhaka there can be no debate, quite simply he has to play. Buying a player of that calibre – for that amount of money – is like buying a brand new Ferrari and keeping it on the driveway, just because your old banger ran well last year. That is no disrespect to Cazorla or Coquelin, but Xhaka is a class above them. There is also the small mater of the Switzerland international’s price tag. How many times have Arsenal spent over £30m on a player? They aren’t Manchester City, individuals costing that much cannot be squad players for the simple reason the club cannot afford them to be. When Xhaka arrived there was a presumption that he would be Arsenal’s new enforcer, perhaps because fans had looked at the Swiss’ tally of red and yellow cards he had collected throughout his career. The reality is much different though. Xhaka may be tough and up for the rough and tumble of the Premier League, but he possesses a passing game which is far superior to that of a regular holding midfield. Now, given the injury to Coquelin, it is likely that Xhaka will finally get his chance but there will be a close eye on how he plays alongside Cazorla. So, how will Xhaka and Cazorla work as a pair? Against Chelsea they seemed to link up okay but that was against a side reeling from Arsenal’s blistering start. In reality, only time will tell and the real tests are surely to come. But one thing that is for certain is that Xhaka is finally where he deserves to be – in the Arsenal first-team. Simon Collings is a journalist in addition to being a Regular Columnist and podcaster here at #ABW – check him out on Twitter at @sr_collings. He is also part of a Premier League Podcast called All About the 3 Points which we definitely think you should check out. This entry was posted in NewsNow, The Bergy Blog and tagged AFC, Alex Oxlade-Chamberlain, Arsene Wenger, Coquelin, Elneny, Francis Coquelin, Injuries, Santi Cazorla, Transfers, Wenger. Bookmark the permalink.